Ships within 7 business days. Please allow up to 2 additional week transit time for your item to arrive. 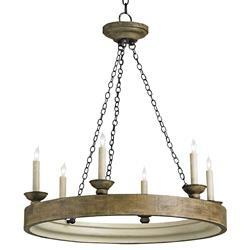 This traditionally styled circular wood chandelier sets the stage for a beautiful smoke wood crackle finish to be illuminated by 6 lights. A perfect compliment to French Country style décor, this piece works with a variety of traditional styles.